Days is a gigastore the size of a small city, whose security men are licensed to kill and whose seven owners, a group of very different brothers, brood in a penthouse far removed from the desperate scramble of consumerism. But at what price consumerism? Security man Frank has lost his reflection, Books has entered a localised war with Computers, and there is a riot in Third World instruments. Time for another flash sale..
United Kingdom: When the village of Downbourne and schoolmaster Fen Morris’ wife Moira is snatched, there are no authorities to turn to. In the absence of its government – in exile in the Caribbean following the ‘Unlucky Gamble – and subject to random bombings and leaflet drops, the UK is lawless and falling apart. Their marriage was a disaster but Fen sets out to recover her anyway; but does she even want rescuing? Sounds like more excellent festive season reading is on the cards. I’m a big fan of the Terminator films, especially the first (original Arnie is awesome) and last (a brilliant way to re-energise a franchise). Luckily, the good people at Titan Books were kind enough to send me some tie-in novels for the Terminator Salvation movie. I’ve always been interested in shared world novels to see what different authors can do but not had much chance to read such fare. Timothy Zahn is a prolific writer and has written a number of franchise novels. It’s clear why; he’s a competent and engaging storyteller. 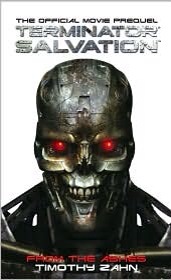 Terminator Salvation: From the Ashes, is a fun, action packed read that drums along at a great pace. Touching on the ever present relationship between John Connor and Kyle Reese, this prequel does a brilliant job at setting the scene, and tone, for the movie’s premise. It introduces some other great characters as well, namely Sergeant Justo Orozco, a US Marine, as well as Connor’s right hand man, Barnes. The novel focuses on Connor’s band of fighters who are trying to prove their worth to the military brass running the Resistance. Tied to that is the story of Orozco and the community he helps to protect, including Kyle and Star. As Skynet closes in on the survivors in LA, Connor sees an opportunity to take the fight to the machines. However, he needs to use his fellow humans as bait, including Orozco’s group. What Zahn does exceptionally well is to sew a line through all the ideas of fate between Connor, Kyle, Skynet and the past/present/future conundrum the franchise presents. We get to see a lot more of what makes the man that is John Connor but also the history of Kyle Reese. It’s fascinating to consider the strange möbius loop relationship that the two men have with each other as mentor/son and soldier/father. Whilst they never meet in this novel, both inadvertently help the other to survive. Terminator Salvation: From the Ashes is also just damn fun. There’s plenty of action amongst the ruins of LA and some of the descriptions really set a fantastic scene as the T-600s try to destroy the human race. If you like the films, check out the book – I’m definitely ready to read some more in the Terminator world. Gollancz, an imprint of the Orion Publishing Group, have announced the acquisition of UK and Commonwealth rights to HOUSE OF SHATTERED WINGS and its sequel by multi award-winning author, Aliette de Bodard. Compared to writers such as China Mieville and Iain M. Banks, HOUSE OF SHATTERED WINGS is set in Paris amongst the aftermath of the Great Magicians War. Paris’s streets are lined with haunted ruins, Notre-Dame is a burnt-out shell and the Seine runs black with ashes and rubble. De Bodard’s rich storytelling brings three different voices together: a naive but powerful Fallen angel, an alchemist with a self-destructive addition, and a young man wielding spells from the Far East. HOUSE OF SHATTERED WINGS will be published in hardback and eBook on the 20th of August 2015. Continuing my way through the excellent anthology, Dangerous Games, and following once more the advice of the equally excellent editor Jonathan Oliver, I set to reading South Mountain by Paul Kearney. Whilst I expected a re-enactment story about war games, I did not expect it to be so fine. I think fine is the correct word. It’s both poignant yet restrained, both detailed but not overloaded. 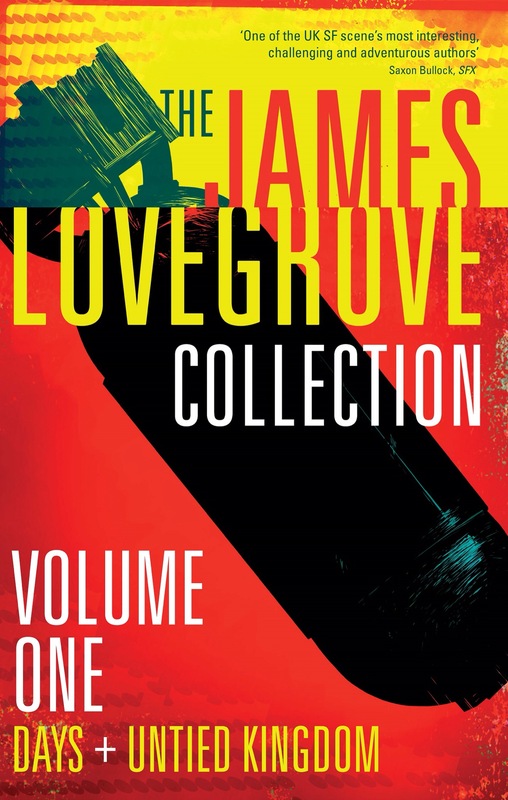 It’s crafted and subtle as opposed to Lavie Tidhar’s brutal effort in the same collection whilst carrying the same power. Concerning a group of Civil War re-enactors, led by a grizzled Vietnam vet and joined by a first-timer skeptic, the tale sets out the characters and setting with a delicate touch. Each man is given their due and soon talk turns to the war and their feelings behind it. As the newcomer, and a black man at that, the protagonist is put on the spot by his Union chums. With his mind set on his ancestors as sleep drifts over their camp, things change from playing at war games to actually being in the war. It is an interesting premise on the time travel trope, fuelled by the protagonists memories and feelings. It’s not a hammer blow but the author has delivered a subtle, moving story. Gollancz filling December with interesting reads..
Gollancz are going to be publishing two interesting sounding novels this December. Check out the blurbs and covers below..
From the acclaimed author of the bittersweet novel A LONG, LONG SLEEP comes a haunting stand-alone sequel. Rose slept for a hundred years and when she awoke the world as she knew it had vanished, utterly. She has gone from being a cherished only child to being the sole heir to a vast, interstellar empire. From being alone to being surrounded by friends; from being protected against everything – whether she wanted to be or not – to having others depend upon her. 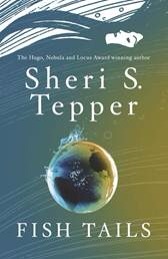 From one of the masters of science-fiction and fantasy, Sheri S Tepper, FISH TALES is an extraordinary novel. Clearly I’m having a short story bonanza at the moment but my recent reading choices have been perfect. Short and sharp is great when you have little spare time but still want for the enjoyment of reading. Die by Lavie Tidhar fits the bill of short and very sharp effectively. Extremely so. I read it on the recommendation of editor Jonathan Oliver’s introduction and it’s a stunning story. The writing is sparse but all that space allows the imagination to run wild. A twist on Russian Roulette, there is little detail to the whys and where of it all but what is there manages to touch at ideas of cruelty and horror but also the depths of humanity. Lavie Tidhar has produced a brilliant take on the game motif. I wanted to fill this review with expletives and exclamations and too many punctuation marks; it’s that hard hitting. The Stranger Cards by Nik Vincent is another inventive take on the idea of game. Her story has the feel of a horror as the creeping, unrelenting truth of the situation crawls into the consciousness of the protagonist. A lawyer sent to meet a death row inmate due to be executed for a series of murders. A child’s game played on an old deck of cards. For those clever with numbers, patterns are laid out but it becomes clear that the game the serial killer taught the lawyer is oh-so-very-sinister. A fantastic and atmospheric tale that reminded me of that horror writing great Stephen King, Stranger Cards manages a lot in with a little and does it brilliantly. 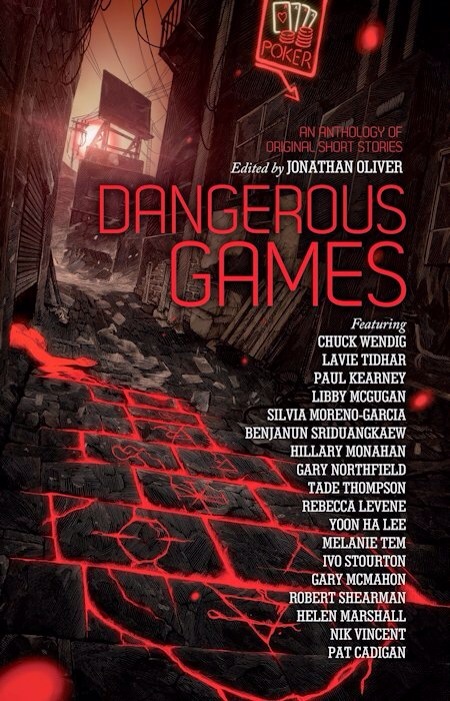 I have one or two (I’d need to check the tower of book boxes) Chuck Wendig novels stashed away, yet to be read so I thought it fitting to start with his story as I began the anthology Dangerous Games. It’s a great premise for a set of stories and Mr Wendig’s opening gambit sets a terrific and terrifying tone. What seems like a set piece, road-rage tale of a man lost and losing his senses changes by turns, each stranger than the last, into something more odd and unsettling than I could have predicted. The mix between the visual failure of the protagonist’s car and his inner monologue, cataloging his many errors, creates a powerful setting. The innocuous confrontation that begins the chase is fuelled with emotion. However, the game is something else here and it’s for Chuck Wendig to tell it. A superb intro story: a bit weird, a bit wild but very entertaining. Chrysalises by Benjanun Sriduangkaew is a totally different ball game altogether (excuse the pun). I’ve read one of Benjanun’s stories before and this strange tale is just another example of her unique talent. The premise, ostensibly, is the notion of war as a game and games as metaphors for war. However, Chrysalises is something else. It’s hard to pin down Sriduangkaew’s style which is both sublime and aesthetic. There’s a real beauty to the writing and an ungraspable imagination at work behind it. Once again I’m struck by this author’s ability to meld ideas into a world so alien yet so grounded, so strange yet so understandable. I know I’ve not said much about the story but this is truly brilliant piece of work that is well worth seeking out. Last year Abaddon Books and Chuck Wendig released a new set of gods into the world with the start of the shared world Gods & Monsters. Now the series will return with a new standalone sequel from Stephen Blackmoore: Gods & Monsters: Mythbreaker. Fitz is an oracle to the gods. Unexpected napping from my son meant unscheduled reading for me! Continuing the weird west bonanza, I chose to read Hugh Howey’s offering to the anthology. As a big fan of his Wool series, I wasn’t disappointed as his short story is a strangely poetic mystery told from the perspective of an itinerant soldier. Having been on the losing side in the American Civil War and now signed up with his former enemies, Howey’s protagonist finds himself deep in unfamiliar and unforgiving territory. After a scout goes bonkers and returns to camp on a killing spree, things go from bad to strange. The tale is wonderfully written as it explores one man’s curiosity and the odd yet enticing path it leads down. Howey has crafted a fascinating story that will stay with you long after you’ve read Hell From The East. Rajan Khanna’s Second Hand is less mystic and more action packed magic. Kicking off in a saloon with a card game, things soon heat up as the two main characters get caught cheating. But it’s cheating by magic and it’s a system that is very cool. It’s all about the Cards, the Play and the Game. A magic deck which gives the owner four suits and some Jokers worth of spells. However, for Quentin Ketterly and his charge Hiram Tetch, there’s more to the Cards than they first thought. Deeper down the rabbit hole they go, the darker things become and they’re soon embroiled in murder and mystery. It’s a great, great story and a brilliantly crafted vision into a magical Western. There’s always so many things to do but when I don’t read, things just don’t feel like they should. 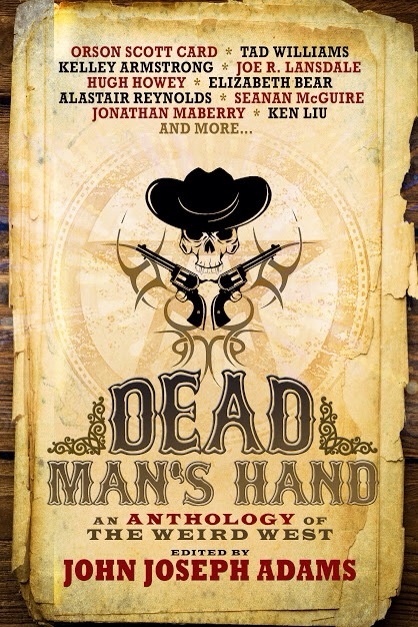 With that in mind, I got stuck in to Dead Mans Hand once again. Alastair Reynolds is a favourite author of mine and it was exciting to read his take on the weird west. Wrecking Party kicks off with a description as Wild West as they come but it’s not long before that tale takes a mighty swerve in the weird direction. Marshal Bill is just trying to keep the peace when a bedraggled drunk starts smashing up the local hoodlums ‘horseless carriage’. Turns out that Bill knows this vandal from the days gone by and the reasons for his destructive streak is both unbelievable but also undeniable. Reynolds’ grasp on his characters is faultless and the atmosphere of a Western is powerful, allowing the story that unfolds to seem as fantastical as it should to a mind unused to machines and technology. Wrecking Machine is almost like a precursor to the terror of Skynet in Terminator, telling of the inevitable rise of the machine. 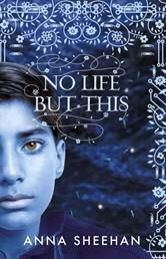 Yet, it is done so subtly and with such impeccable design that it’s a story that will stick with you. The final little salute to the story and it’s narrator brought a smile to my face, reinforcing Reynolds’ skill as a storyteller and this tale as one of my favourite shorts from the anthology by far.